Go to church or..!. No offense, believers :) It's just so funny :D. Wallpaper and background images in the Critical Analysis of Twilight club tagged: twilight funny anti church god. God has better things to do, definitely. That's a pretty powerful threat. 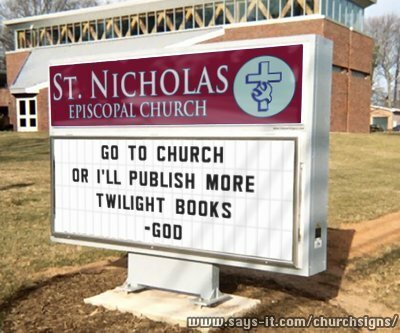 I rather more Twilight Books. XD I hate Twilight...But I have no time for chruch, sorry! Wow...that almost makes me want to go to church. Almost. Damn, I'm...torn. God has quite a bit of humor, I like this guy! GAH! Okay! I'll convert to whatever you want! Just don't publish any more! OkayOkayOkay, I'll go to church. NO! PLEASE! I'LL GO TO CHURCH! I already go but He would never be that bad.